Camp Swift was founded as a social action project of the Southwest chapter of the North American Federation of Temple Youth (which was then called SWFTY, and is now called NFTY SW) by Jewish teens who wanted to share the gift of a camp experience with kids who would otherwise never be able to afford it. The Camp Swift program initially included one annual 4-night, 5-day overnight camp session each summer. We're not 100% sure on the exact date this came to be, but around 1983, the iconic Peace, Love, & Happiness Camp Swift logo was born. 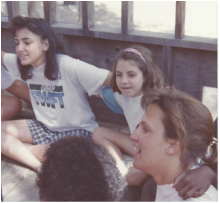 The Camp Swift program incorporated as an independent 501 (c)3 nonprofit organization on March 23rd, 1995 as “The Mitzvah Corp Foundation” (The name was later changed to Camp Swift Youth Foundation and then Swift Youth Foundation after that). After years of offering one session of the overnight camp each summer, a second session was added in 1997. This significantly expanded the reach of the organization by doubling the amount of youth and teens who could benefit from the life-changing experience of attending Camp Swift. The first annual Camp Swift Carnival was held in partnership with ACME foodservice distributor, a wonderful sponsor who continues to provide a large portion of the food for Camp Swift meals. Swift's first after school programs were held at Palomino Elementary School. At these programs teen counselors volunteered to provide tutoring help and soccer activities to 2nd-6th grade children. Whitney Jacobson was hired as the organization's first full time Executive Director in 2004 to help the organization more effectively expand programming and develop partner relationships. Club Swift was established as a year-round program to cultivate former campers and other teens as community leaders and mentors at Swift's programs. Leadership Camp was started as a follow-up program for campers and counselors who attended Camp Swift the previous summer where participants engaged in a full day of fun and enriching camp-like programming that built on everything learned at Camp Swift the previous summer. After over 20 years with Peace, Love, and Happiness, Swift finally had the opportunity to re-brand (for free!) with a new logo and name to more accurately depict the breadth of all of the organization's programs at the first-ever Createathon Phoenix event! Click the video to the right to learn more about the meaning behind the new branding. Today, the Swift Youth Foundation is still carrying along the dream of our founders – all of our programs include tons of food and fun & enriching activities, and we're fostering more positive mentor relationships than ever with our expansive year-round programming. Do you have info on Swift's history you'd like us to add to this timeline? We want to hear from you! ​Email us at info@swiftyouth.org to fill us in!